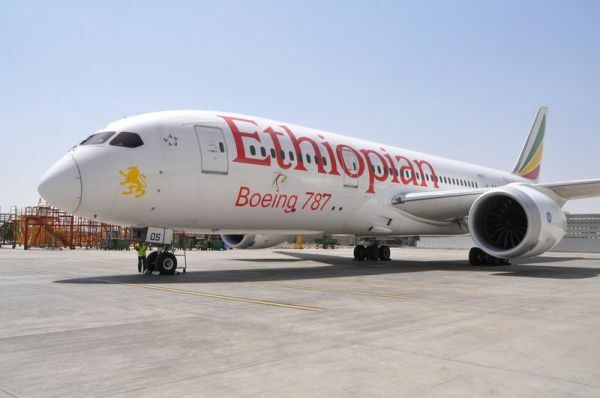 CAPE TOWN - Ethiopian Airlines is Africas biggest airline since some time, ranging in front the former market leaders from the continent, SAA, Kenya Airways and Egypt Air. Ethiopian Airlines has long held the reputation of being Africa’s best airline, an assertion supported by its continuous profitability, its modern aircraft fleet and its impressive route network. With currently 54 destinations just in Africa it serves so many points in this region as no other carrier. Ethiopian aspires to be a global airline, not only on African services. From March for example it will start serving Buenos Aires, as second destination in Latin America after São Paulo. The foremost objective in this is to connect South America via Addis Ababa to Asia. And Europeans can travel on the cheap from Dublin to Los Angeles – on Ethiopian. “We want to establish Addis Ababa as the Dubai of Africa,” says the charismatic CEO Tewolde Gebremariam in talking to PaxEx.com. Ethiopian is constantly Africa’s first airline in bringing in the newest jets of its generation. As was the case with the Boeing 777-200LR (November 2010), 787-8 (August 2012), 777-300ER (November 2013) and most recently the A350 (September 2016). With an average fleet age of below six years the airline also ranks high in a global comparison. My trip takes me from Frankfurt for a stopover in Addis Ababa to Cape Town, a daily connection well liked by Europeans. Especially as Ethiopian counts among the airlines offering bargain fares while still not being cheap, at least not in Business Class. 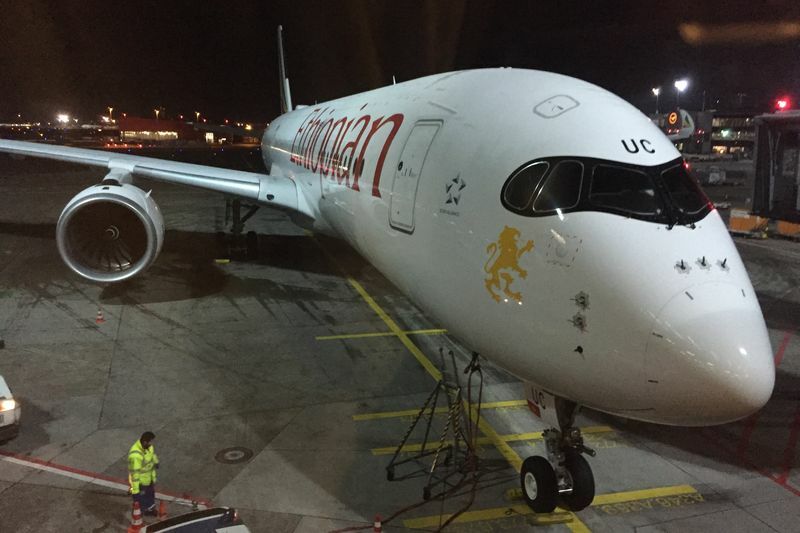 In Frankfurt one of the newest Ethiopian aircraft awaits for the short night flight to Addis Ababa, the A350-900 registered ET-AUC. At the time of my trip this was the newest aircraft in the whole fleet, the sixth A350 of 24 ordered, in early February however the seventh A350 was delivered. Business passengers can make use of the Business lounge of Star Alliance partner Lufthansa, not far from the gate and delightfully quiet at this this hour. Boarding starts on time and proceeds flawlessly. No other A350 operator so far has installed as many seats on board as Ethiopian with a total of 348, of which 30 are in “Cloud Nine”, as the Business Class cabin is named. That of course is reflected in the configuration of the front cabin as well. While most operators such as Finnair or Cathay Pacific offer their premium customers a 1-2-1 product, Ethiopian remains as conservative as Lufthansa and keeps the less comfortable 2-2-2 configuration. Similar to Lufthansa the seats on Ethiopian’s A350s are turned slightly outward towards the windows or against each other in the middle section. This enables the carrier, despite a relatively tight pitch of 65’’ or 165cm, an inch more than on Lufthansa, to fit in full-flat seats. Interestingly, the A350 currently is the only aircraft of Ethiopian Airlines allowing for a 180° degree recline. Ethiopian’s cabin makes a statement through its bold red seat covers, while other airlines prefer more understated darker colours, and it’s even accentuated with bright green woollen blankets stationed on every seat. This evening it’s quite empty up front, with not more than a third of the premium seats being occupied, mostly the back rows. My seat is 2A, but it springs to attention how unbelievably tight the foot space in the bed position is here, a small red triangle maybe 20cm wide. I switch to 1A, as all front rows are completely empty. This changes the situation fundamentally, here there are dedicated boxes for the feet at least three times as wide and no restriction of foot space whatsoever. This seems to be a lesson for all modern lie-flat Business Class seats, one that I last learned in the new A380 cabin of Singapore Airlines: Only the bulkhead rows are offering sufficient foot space, at least for people with shoe size 46 (13 in the US) like me. Interesting in Ethiopian’s Business Class seats are the wide consoles above the armrests on one side, containing for example the remote control for the IFE. The fact that the seat pockets are hidden at shoulder level attached to a more symbolic divider is only discovered once one tries to find the headphones. Ethiopian Airlines is mastering in putting Ethiopian hospitality to work on board, as the female flight attendants (I never saw any male cabin crew) are wearing a white Ethiopian national dress with a colourful woven scarf. Already before take-off chilled French champagne (Lallier Brut) is served, even filled up without me asking for it. We take off on time around 10pm local time, flight time to Addis is not even six hours, and there it’s two hours later than in Frankfurt. As I have local appointments already in the morning I need to use every chance to get a some sleep before. That’s why I eat in the lounge before and only have a short look into the opulent inflight menu: Crayfish/Smoked Trout or two soups to choose from as starters, four main courses to pick from (Goulash with Spätzle, two kinds of Panzerotti pasta plus Barramundi fish) plus Gugelhupf chocolate cake, fruits and cheese. On top of that there is a full hot breakfast (cheese omelette with Turkey or sweet crèpe), and for both also express options. One could spend at least two thirds of this short night eating. I however use the content of the bright yellow amenity kit (on other flights it can be bright green, with the content coming in the same respective bright colour) to get ready to sleep immediately after take-off. The bed extending 198cm is very comfortable, at least in the first row thanks to the large foot space. As nobody sits nearby the very limited privacy of this seat configuration doesn’t matter tonight. Still my sleep is not undisturbed, because soon it gets much too warm in the cabin. As I intervene the flight attendant claims: “24°C is the ideal cabin temperature.” No, it’s not, nobody sleeps well in 24°C. Overheated cabins are one of the most notorious complaints on night flights, a major Pax Ex issue that airlines have to address. At least after my intervention it gets a little cooler. Still I am all but well rested when we land after only 5:47 hours, ahead of schedule and still in a bright full moon over Addis. Under different circumstances one would have been able to sleep well as Ethiopian’s A350 offers a respectable product. And despite the visa obligation, immigration to Ethiopia goes smoothly, also thanks to the new E-Visa. A little over 24 hours later I am back at Bole Airport for the onward journey to Cape Town. The Chinese currently construct a new terminal, whose first phase is supposed to become operational during this year. Until then, things get fairly tight during the morning rush hour in the old terminal. But even at passport control there is a fast lane for Business passengers, and I make it fairly swiftly into the Ethiopian Airlines lounge. This has grown to enormous dimensions and offers some special features. A smiling lady brews coffee right at the entrance in accordance to the famed Ethiopian coffee ceremony and offers the brew to guests. Looks very alluring and authentic even to non-coffee drinkers like me. Right nearby a full breakfast buffet awaits, highly welcome. Like in good hotels there is even a station where a chef prepares fresh bespoke eggs and omelettes. I have never seen this in a lounge before and wonder why not? It’s so simple and makes such a difference to warmed-up instant scrambled eggs elsewhere. Today one of Ethiopian’s oldest Boeing 787-8s registered ET-AOO is tasked to operate the flight to Cape Town, having already been delivered in July 2013. Proceedings here again are overly punctual, the aircraft is almost fully booked. I am sitting in the last row of Business Class in 4A, theoretically a window seat, only that there is now window directly at this seat and I have to bend forward a lot to peek out of the next window. 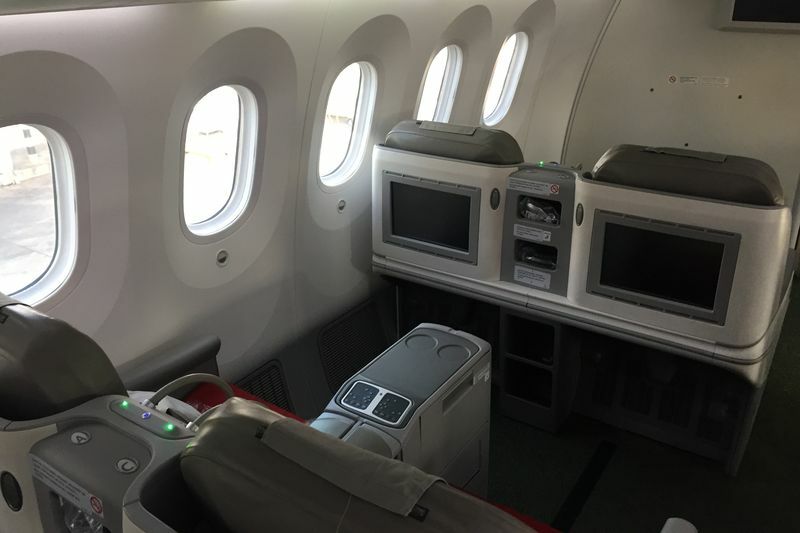 In the 787 the 2-2-2 seat arrangement is similar for the 24 Business Class seats, not offering a full-flat mode, just an angled lie-flat with 170° recline, as all Ethiopian wide-bodies currently despite the A350. Important to know as Ethiopian switches aircraft fairly flexibly according to demand, meaning you don’t know if you’d end up in a 777, 787 or A350 really. And it’s a bit of a mystery as the 787 has a seat pitch of 68’’ or 172cm, an inch more than on the A350. But in contrast to the Airbus, the Dreamliner seats don’t offer any foot space in a box, instead the footrest of the seat extends to the horizontal position, with the headrest remaining slightly raised. Problem is that this severely restricts the foot space in bed position, I can only accommodate my feet if I lie down sideways. And the seats are clearly worn, the cover of my footrest has been half torn off, dirt has accumulated in gaps and the seat rails. Here Ethiopian has to act more proactively. Although we leave the gate even before the scheduled departure time, a prolonged wait at a holding point near the runway slightly delays the departure, without the captain giving any explanation. Flight time is supposed to be about six hours. To my delight Ethiopian Airlines is not one of those carriers stubbornly serving a meal after take-off no matter what time of day it is. Such as United Airlines does on their flight from Hamburg to Newark, where they then serve a full lunch with steak at 9.30am local time. Three hours pass, during which I work, read and listen to some beautiful audio CDs in the IFE. Real highlight is a panoramic view of Africa’s highest peak, Mt Kilimanjaro in Tanzania, which I marvel at as probably the only passenger on board, as all others watch movies or sleep. Three hours after take-off, once some appetite comes up, the ladies in their white dresses bring on lunch. There are two starters to choose from, but without asking for my choice they serve me tuna. I ask for the other one, oyster mushrooms with rice, and get it besides the other one. Both are just so-so. But then the highlight: A buffet trolley full of Ethiopian delights is pushed through the cabin. Anyone who has ever been to Ethiopia will love this, and that who haven’t will get a very good preview of what it has to offer. Several curries, eaten with Injera bread and tasting outstanding, some of them very nicely spiced. 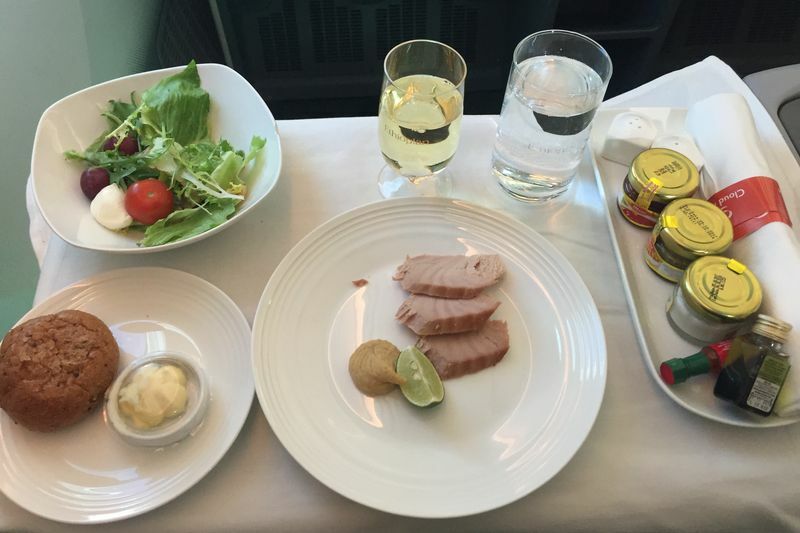 The opposite of bland, predictable airline food. Bravo! I’m basically full when the actual main courses arrive (a choice of chicken, beef, fish or vegetarian), and my Nile perch in a strangely sweet sauce disappoints after this tasty Ethiopian fireworks before. In any case, it needs to be accompanied by one of the great Ethiopian wines, I try the Chardonnay from the Rift Valley. And then a bit of cheese and fruit for dessert, followed by tea and chocolates, and I’m prepared for Cape Town where we land on time after 6:05 hours. 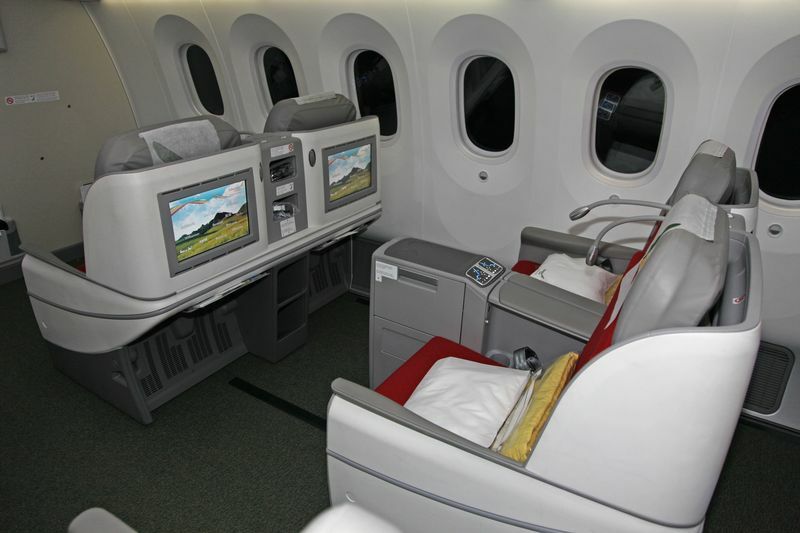 Ethiopian Airlines offers a high-class Business Class product for a mostly fairly competitive price. 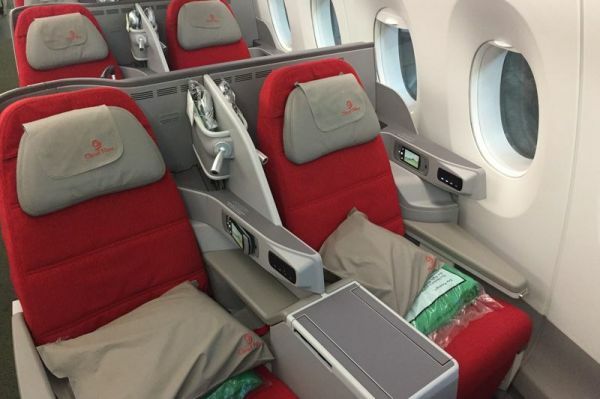 Unfortunately Africa’s leading airline didn’t commit so far to install full-flat bed seats in all of its wide-bodies, which are pretty much standard these days for premium airlines. Full-flat seats currently restricted to lucky passengers on the A350s. As soon as the new terminal will open, the hub efficiency in Addis Ababa will further increase. Ethiopian is a role model how cleverly a national airline can promote its home country.